When I read lables that boast "500mg of Omega 3 Fatty Acids Per Serving," I expect the product to taste like some nasty oily medicine. So my expectations are already low...but that's just me. I'm weird. It's probably some psychological issue I have. Also, I'm seeing tons of walnuts in this bag, and I'm not the biggest fan of walnuts. Sonia loves walnuts. I'm more of a peanut, pecan, and almond kind of guy. So, as I'm writing this, I'm trying this trail mix for the first time. Appropriately, I have just come in from a long walk outside on the urban trails of Hollywood. (No, I'm not talking about Runyon Canyon - just the sidewalks...but I walked at least two miles by my calculations). OK, well the first thing I notice is that the packaging is poorly designed. The bag is not resealable. I will have to put the remainder of the mix in a tupperware container after I try a few handfuls. And, the package just exploded as I opened it. It's one of those bags where as soon as you've applied enough force to get the package open, you've already applied too much force. I just spent five minutes picking up nuts and berries off the floor. I'm docking at least a half a point for that. How frustrating! So, there aren't as many walnuts as I first expected. It's not bad. Every third bite or so, I get kind of a medicinal flavor on my tongue...just slightly. The berries are very oily, and now my hands are quite sticky. If you're really hiking with this trek mix, be sure to bring some moist towelettes - or dip your hands in a stream nearby. There are way too many pepitas. (That's what Latinos call pumpkin seeds). Now, I don't have a problem with pepitas by themselves, but I'm not a big fan of them in trail mixes. 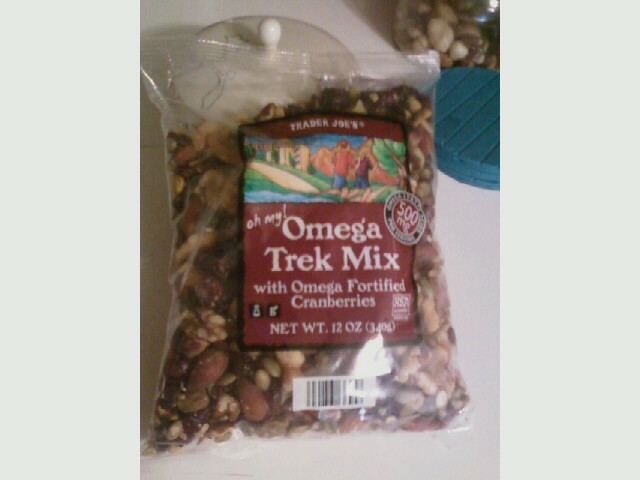 I like trail mixes to be a little sweet, and pepitas are decidedly salty. The bag sells for $4.48. Other than that, this trail mix passes. I give it Three out of Five Stars. Sonia gives it Four out of Five Stars. Bottom line: 7 out of 10.